Get realistic, hard-hitting football action with Super Bowl champ Tom Brady and other players like Tony Romo, Ray Lewis, Peyton Manning, LaDainian Tomlinson, Steve Smith, Adrian Petersen and other NFL super stars as kids. Build your dream team from 15 pro players as kids; put them on your favorite NFL team or a wacky Backyard team. 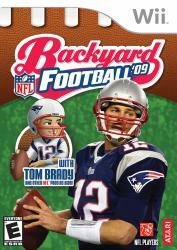 And now for the first time, Backyard Football 09 features dual card wireless Multiplayer Mode along with the ever-popular season and single game options. Outrageous power ups and unlockables combined with authentic football action make Backyard Football �09 the most fun you can have off the field.